The prescriptions for sacrifice described in Leviticus present problems for those seeking a Girardian, non-sacrificial reading of the Bible. The ancient sacrifices also pose a problem for Christian animal advocates, who claim that God cares about animals. Why would such a God accept or even encourage killing innocent animals? A closer look at Leviticus offers some insights. First, Leviticus chapters 1 and 2 repeatedly refer to the proper way to make sacrifices of animals or plant foods if one wishes to make an offering to the Lord. God does not command animal sacrifices here. The ancient Hebrews lived among animal-sacrificing peoples, and arguably they could not imagine a God who had no desire for animal sacrifices. They were convinced that sacrifice was necessary to approach God and to appease God after one had transgressed God’s laws. Later revelations by the prophets and Jesus would help the Hebrews, and then all humankind, realize that God desires mercy and not sacrifice (Mt 12:7). Leviticus chapter 3 discusses peace sacrifices, and again the Scriptures describe such sacrifices as optional. Once again, Leviticus elaborates on the proper ritual “if” the sacrifice is an animal. Chapter 4 gives instructions for sacrifices if one unwittingly violates one of God’s commandments. 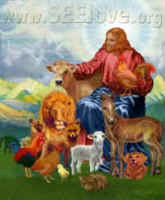 Given the cost of animals, this would have encouraged mindfulness of God’s laws, which were crucial in maintaining the ancient Hebrews’ unique identity and in maintaining faith in the radical notion of a solitary, invisible God. Leviticus chapter 5 discusses how one is to make amends for sins against other people and then offer a sacrifice to God. The ancient Hebrews were not prepared for the injunction to forgive, and Leviticus chapter 5 offers a more primitive means of avoiding mimetic escalation of violence. Even today, even after receiving Christ’s ministry that teaches love and forgiveness, we find forgiveness extremely difficult. Anger prompts violence, and killing animals was a scapegoating alternative to escalating human violence. Indeed, uncontrolled violence was the reason that God delivered the Flood: “the earth was filled with violence.” (Gen. 6:11) Perhaps God allowed Noah to eat animals as an outlet for human violence, since unrestrained violence was unacceptable. Similarly, animal sacrifice may have been a substitute for human sacrifice. There are many biblical references to human sacrifice—primarily children--and even Abraham was set to heed the command to sacrifice his first-born son. In such a culture where one was often expected to sacrifice one’s own beloved children, a prophet who called for an end to all sacrifice would have been dismissed as absurd or banished as demonic. The path towards ending all sacred violence, then, required animal sacrifice as a substitute for human sacrifice. Therefore, God’s concern for animals is not disproved by the Levitican sacrificial code. The code indicates that God is more concerned about humans, but this does not mean that we have license today to treat animals with cruelty or neglect. As we will see next week, the Hebrew Scriptures dedicate considerable attention to the problem of violence, presumably because the ancient Hebrews understood that violence can easily escalate and always threatens to tear communities apart.